Gov. Terry McAuliffe (D.) signed an executive order unilaterally instituting new forms of gun control in Virginia on Thursday. The order bans the lawful carry of firearms within certain state buildings and calls for the establishment of a joint task force focused on prosecuting gun crimes. 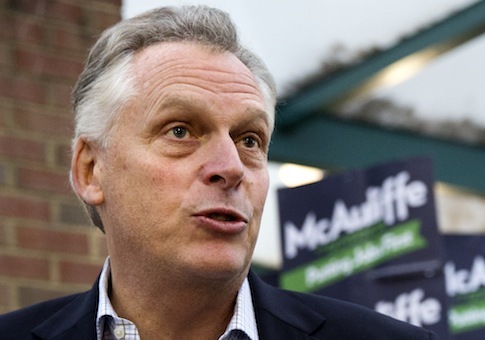 McAuliffe has long been a proponent of strict gun control. In recent weeks he has publicly stepped up his call for more gun control measures, speaking at a gun control rally outside the Capitol in Washington, D.C. He said the actions he was taking are necessary to prevent violence. "The actions directed in this executive order will help our Commonwealth better enforce Virginia laws designed to keep guns away from people who would use them for harm," McAuliffe said in a statement. "The task force I have convened will take tangible steps to bring more successful prosecutions of gun crimes, and the other steps outlined in the order will aid in our efforts to keep families safe from gun violence." "We must continue to work to overcome political resistance to commonsense gun safety legislation, but in the mean time I am committed to using every power of my office to prevent senseless killings." The new ban, which will go into effect within 30 days, applies to both open carry and concealed carry. "I hereby declare that it is the policy of the Commonwealth that open carry of firearms shall be prohibited in offices occupied by executive branch agencies, unless held by law enforcement, authorized security, or military personnel authorized to carry firearms in accordance with their duties," the governor’s order said. The order also called for banning concealed carry in state offices except by security or law enforcement personnel. McAuliffe said in his order that the gun carry ban was necessary to protect Virginians. "The ease of access to firearms by criminals and others intent on harm is even more concerning when viewed in light of the general open access to our public facilities," the order said. "Every day, over 60,000 Virginians report to work in state government buildings across the Commonwealth to provide services to their fellow Virginians. Our citizens rely on open access to these facilities to address their personal and professional needs." "Allowing open carry in these facilities by individuals who may not lawfully possess a firearm exposes our state employees and fellow citizens to unnecessary risk," the order reads. Under Virginia law, it is illegal to carry a firearm one is not legally allowed to possess. The Joint Task Force to Prosecute Gun Crime, according to the governor’s order, will "develop strategies and coordinate efforts to strictly enforce existing gun laws under state and federal law." It will focus specifically on ensuring that "only licensed firearms dealers engage in the business of selling firearms" and "that persons prohibited from owning firearms are prevented from obtaining them." The task force will be made up of state and local prosecutors, justice officials, and law enforcement agencies, as well as "federal partners." The order also granted Mark Herring, the state’s attorney general, the ability to prosecute illegal firearms sales and set a policy that Virginia State Police must request a trace of all firearms used in a crime and encourages judges and prosecutors to confiscate guns from those convicted of a felony or domestic abuse. Virginia Republicans were critical of the governor’s actions and noted that the new ban would only apply to state buildings connected with the executive branch. The state house majority leader questioned whether the governor’s instructions to law enforcement were redundant and accused him of interfering with law enforcement. "The governor’s decision to prohibit firearms in state buildings is shortsighted," said Del. Todd Gilbert, the deputy majority leader. "As we have seen again and again, such policies leave law-abiding citizens vulnerable to acts of senseless violence rather than protecting people from such tragedies." Virginia Republicans also vowed to revisit the executive order in the legislature during the 2016 session. "We will review this policy during the 2016 legislative session and take the appropriate action to protect the rights of law-abiding citizens," Gilbert said. McAuliffe said that the actions he is taking do not amount to a "magic solution to curbing gun violence," adding that he and other state officials are "committed to doing everything within our power to prevent gun violence in our communities." This entry was posted in Issues and tagged Gun Control, Guns, New Gun Laws, Terry McAuliffe. Bookmark the permalink.